Standard Pacific Homes, one of the nation’s leading luxury home builders has finally announced the long-awaited Pre-Construction Grand Opening of their newest South Florida community located in Jupiter. These grand estates situated on oversized home sites, some up to 1.5 acres, will be surrounded by some of Florida’s most exceptional scenery of pristine lakes and natural preserves and wetlands. With only 127 homes starting in the upper $700,000’s and ranging in size from 3,199 sq. ft. to 5,600 sq. 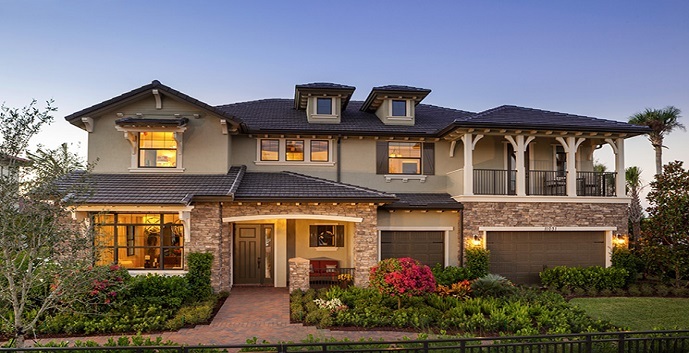 ft., these homes are expected to sell out quickly. The Coventry is a one story, 3 bedrooms, 3.5 baths, 3199 square feet home with a 1 car and 2 car garage. Top features include a gourmet kitchen, casual dining area, formal dining room, great room, den, 2 spacious lanais, and a courtyard. The Stamford is a one story, 4 bedrooms, 3.5 baths, 3483 square feet home with a 3 car garage. Top features include a gourmet kitchen, casual dining area, formal dining room, family room, living room and a covered lanai. The Yorkshire is a one story, 4 bedrooms, 5.5 baths, 3635 square feet home with a 1 car and 2 car garage. Top features include a gourmet kitchen, casual dining area, formal dining room, great room, club room, lanai and a courtyard. The Fairfield is a two story, 5 bedrooms, 4.5 baths, 4086 square feet home with a 1 car and 2 car garage. Top features include a gourmet kitchen, casual dining area, formal dining room, great room, covered lanai and loft. The Alexandria is a two story, 5 bedrooms, 4.5 baths, 4545 square feet home with a 3 car garage. Top features include a gourmet kitchen, casual dining area, formal dining room, family room, covered lanai and loft. The Barrington is a two story, 5 bedrooms, 4.5 baths, 5284 square feet home with a 3 car garage. Top features include a gourmet kitchen, morning room, formal dining room, family room, living room, study, bonus room, and a lanai. The Wakefield is a two story, 5 bedrooms, 5 full baths, 2 half baths, 5476 square feet home with a 4 car garage. Top features include a gourmet kitchen, casual dining area, formal dining room, great room, den, game room and covered lanai. The Wentworth is a two story, 5 bedrooms, 6.5 baths, 5691 square feet home with a two car garage. Top features include a gourmet kitchen, casual dining area, formal dining room, family room, living room, club room, loft, covered balcony and covered lanai. For more details on builder incentives and how to save money building your custom dream home in the Prado community, please contact your R1S1 New Construction expert at 855-639-7171.